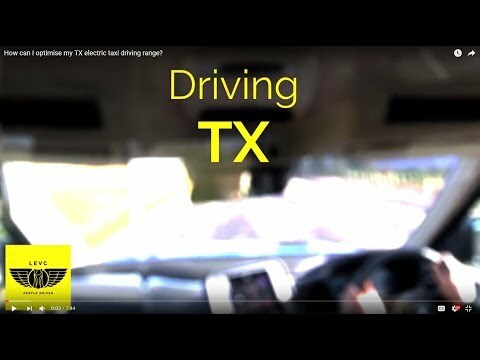 Many techniques for driving efficiently apply regardless of the vehicle, but there are also some ways to adapt your driving style and habits to better suit the electric taxi. By following a few simple tips can help ensure you’re maximising your electric range - meaning lower fuel costs and fewer stops to recharge. In an electric vehicle, the cabin temperature is maintained electrically using energy from the drive battery. When charging your TX, whether overnight at home or on-street, you can set a ‘Parking Climate’ timer to prewarm or pre-cool the cabin using the mains electricity. This feature automatically activates the climate control system to restore the last set temperature and fan speed. This means energy isn’t taken from the battery to do the same job after you’ve driven away, helping to preserve your electric range…plus, you get to climb into a cab that’s just the way you like it. With responsive controls and plenty of performance, TX is a fun cab to drive - the electric motor provides its torque straight away, without needing to rev up like a petrol or diesel engine… and it’s so quiet that most drivers accelerate more quickly than they usually would. The gauge on the driver display is a good indicator of how efficiently you’re driving, it shows the power being used in real-time. The more the needle moves, the move energy you’re using; so try to drive smoothly and consistently, avoiding the extremes of the gauge. And if your right foot gets too heavy, the dial will turn from blue to amber, so keep an eye on this gauge and try to ‘stay in the blue’. The biggest change in the way you drive an electric vehicle is how you slow the vehicle. The TX has a braking system that can take the energy normally lost as you slow down and use it to recharge the battery. To get the best range, make sure you select maximum regeneration every time you start the cab. Use this to slow down, only using the brake pedal to hold the cab stationary. As you let off the accelerator you’ll feel the cab slowing down instead of coasting and you’ll see the power gauge start to move towards regeneration instead of propulsion. And while much of this harvested energy is used to re-charge the battery, it’s always better to avoid unnecessary acceleration in the first place, as it takes more energy to accelerate than can be captured as you slow down. If you’re using the brake pedal too often you’re wasting that energy, and wearing your brake pads faster than you need to. …the stored electrical energy is best deployed in an urban environment, where speeds are lower and congestion leads to stop start driving. That means if you’re travelling on free-flowing faster roads it’s often better to select the ‘SAVE’ drive mode. This maintains the battery’s state of charge, so that when you reach the city you can utilise the stored energy when it is at its most effective. There’s some other good advice that applies, regardless of the vehicle you’re in. From making sure tyres are correctly inflated (expect a 0.5% decrease in efficiency for every 1PSI underinflated), to dropping your speed on dual-carriageways and motorways. A vehicle travelling at 70mph typically consumes 25% more energy than one travelling the same distance at 50mph, but the effect multiples the faster you travel, so even a reduction of a few mph can make a big difference. It’s not just the way you drive that can impact how much you spend on fuel. Think about the way you use the equipment in your TX. Electric vehicle batteries work best at the right temperature, so on very cold days some of the energy must be used to heat the drive battery. For example. In testing, our drivers experienced a 15% reduction in range between August and February. TX even features a programmable timer that allows you to warm the cabin from the mains supply while plugged in to a charge point. That means you come back to a warm cab and you don’t need to use energy from your battery to warm up once you set off. In an electric vehicle there isn’t a free source of hot air under the bonnet like in a combustion engine vehicle. Switch on your heated seat to maintain a comfortable temperature, instead of turning up the cabin heating, which has to warm a large volume of air and is therefore far less effective. On a hot day, open a window at slow speeds instead of turning up the air-conditioning… but never do both, that freshly cooled air will disappear outside, making the system work much harder to maintain the desired temperature. …and if there are no passengers on board, switch off the rear zone to reduce energy consumption. The driver’s display shows the battery charge and petrol fuel level. This information is used in conjunction with the outside temperature and current energy usage to forecast the electric-only and total range possible. This is provided so you can plan ahead and best deploy the battery energy, so the figures displayed are conservative… and because only Pure EV mode will deplete the battery fully, the forecast range for the ‘Save’ and ‘Smart’ drive modes will be a few miles lower. A great way to track your progress is to use the on-board displays. The ‘driver performance’ display on the central touch screen shows your average efficiency and energy consumption and records the history on a graph. Try selecting the ‘reset after every trip’ option so you’re able to try out some of these tips and see how your average efficiency improves from day to day. The more the needle moves, the more energy you’re using. Coasting is more efficient than braking; but when you need to slow down, use regeneration instead of the brake pedal. Use the drive modes to best meet your working needs, but only use your range-extender as much as you have to. You can extend your range even further by switching on your heated seat or opening a window, instead of turning on the heating or air-conditioning. The official LEVC app contains operator's information for The TX in 2017 and onward. • Search information via keywords or category or alternatively via visual navigation. An Internet connection is required the first time that the app is used and when downloading updates to your app. After downloading, the operators information is available without an Internet connection. The operator's manual is available for all models from 2017 and onward, as well as in all languages. More information is available in the app.